Place potato slices in a steamer basket; place in a small saucepan over 1 in. of water. Bring to a boil; cover and steam for 5 minutes. Add beans; steam 8-10 minutes longer or until vegetables are tender. In a jar with a tight-fitting lid, combine the oil, onion and garlic; shake well. 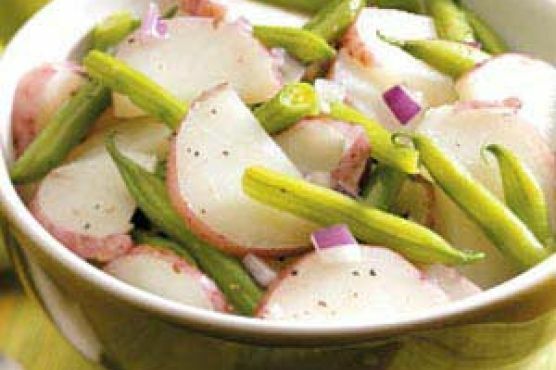 Transfer vegetables to a bowl; add dressing and toss to coat. Season with salt and pepper. Cover and refrigerate for at least 1 hour.